Santa Sativa cannabis seeds by Dinafem Seeds belong to a feminized, Sativa-dominant cannabis strain obtained by crossing a Haze#1 and a Skunk x Northern Lights. It is a top-notch hybrid that will delight Sativa lovers and cannabis connoisseurs alike. This Sativa lady lives up to the expectations. 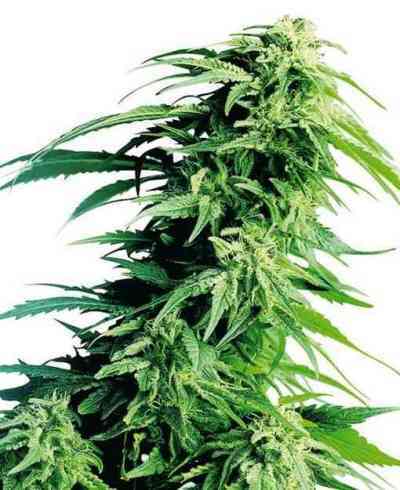 It grows into an extraordinary, easy-to-grow, big, vigorous marijuana plant that produces long, dense resinous buds with a captivating scent. One of the first strains of the Dinafem’s catalogue and still one of their favourites. Santa Sativa cannabis seed performs well indoors both with a short growth and in SOG. Outdoors it enjoys dry, hot, sunny, Mediterranean and temperate climates. The high-quality crops it produces make up for the somewhat long flowering period. For optimum results, give the plant a nutrient-rich diet. The flavour and aroma are pronounced, with hints of lemon, cedar, incense and pine. The long-lasting effect is powerful, euphoric, clear and cerebral. It is the perfect marijuana strain to have interesting debates with your friends.